What better way to start the new millennium than with a family holiday! I had longed to visit the Nilgiris (in the state of Tamil Nadu in south India) for a long time and finally decided to make it our 'Millennium Family Holiday' destination. We stayed at Coonoor at the Dunmore House (you may follow the link to find out more about this Holiday Home for serving and retired Indian Naval Officers). Dunmore House is superbly located at one of the highest points in Coonoor and is a 5-minute walk from the famous Sim's Park. We had a lovely stay there -- spent a great deal of time merely lazing on the beauiful lawn whenever it was bright and sunny (luckily it was so on most of the days during our stay). Apart from 'sunlazing' on the grass at Dunmore House, we also visited a few nearby places during our holiday. The following paragraphs briefly outline the places we visited and the things we did. Coimbatore : A nice Tamil city. Our train journey to and from the Nilgiris was via Coimbatore. We didn't do any sightseeing here. 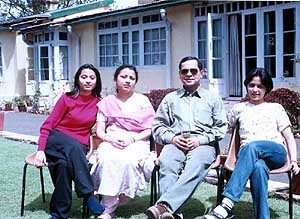 The high point of the few hours we spent in transit here was seeing the film 'Kaho Na Pyaar Hai'! You see, we had some time to kill while transiting thro' Coimbatore on the return leg and the daughters seized upon the opportunity as we were passing by a theatre showing this new film. We found it quite entertaining. Toy train : The trains operating on the narrow gauge lines in the hilly regions of India are popularly known as the 'Toy Trains' due to their size, speed and interesting serpentine tracks meandering across the hills. The few Toy Trains still operating in the country are the Shiliguri - Darjeeling, Kalka - Shimla, Pathankot - Joginder Nagar, Neral - Matheran and Mettuppalaiyam - Ooty sections. Mettuppalaiyam is about 40 km from Coimbatore. This small town is at the foothills of the Nilgiris. 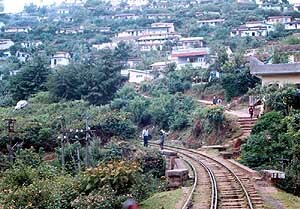 Nilgiri Railways climbs from Mettuppalaiyam to Ooty covering a distance of 46 km. It is, interestingly, the only 'rack railway' system in the country. While climbing, the engine is at the rear and pushes the coaches rather than pulling them. When the gradient is very steep, a mechanism underneath the locomotive gets activated which engages with the toothed rail (also called 'rack', this is the third rail in between the two usual ones) giving extra grip and push. The first class compartment is the leading coach of the train and, there being no locomotive in front, gives a beautiful view of the scenery all around while climbing up as the photo above shows. The scenery is beautiful and I would recommend a ride on the Toy Train to anyone planning a trip to the Nilgiris. Coonoor town : Though the city centre (main marketplace / bus depot / rly. station) is rather congested and dirty, things get increasingly pretty as you move away (and higher) from it. Sim's Park (Upper Coonoor) : This lovely little botanical garden is named after J.D. Sim, a member of the Governor's Council, who took great pains in laying this public park and garden in 1874-75. The park lies in a little ravine and an artificial pond has been constructed at the bottom. The park has many different species of exotic plants / shrubs / trees. We liked the 'Elephant's Foot' trees and saw a Rudraksh tree for the first time. DSSC Wellington : As a 'fauji', I simply had to visit the Defence Services Staff College at Wellington. Was suitably impressed. The most pleasant thing was to come across a few young officers doing the Staff Course whom I knew. 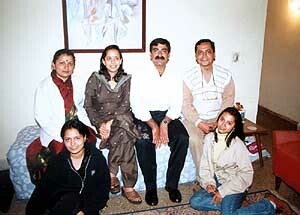 Spent an enjoyable evening with Major Vineet Bhatia and his wife Monica at their residence in the Gorkha Hills. Ooty Botanical Gardens : A must see in Ooty. Much bigger and prettier than Sim's Park at Coonoor. Contains over 2000 species of flora from all over the world. Started over 150 years ago by European residents with the object of 'raising English vegetables at a reasonable cost', it was subsequently converted into a botanical garden through the efforts of one W.G. McIvor of the Royal Botanical Gardens in England who was made in-charge of this garden in 1848. What was once a deep ravine was transformed into an exquisite garden of about 50 acres at his trained hands in a matter of just 10 years. Dodabetta Point (Ooty) : One of the best tourist spots of Ooty. 'Dodabetta' means 'the big mountain' and is the second tallest peak (8640 feet / 2633 metres) south of the Vindhyas. Folklore has it that Sullivan first set eyes on the Ooty valley from this peak and the view of the valley below was so breathtaking that he immediately decided to set up a township there. On clear days one can get a panoramic view of Ooty and its environs, the various mountain ranges that make up the Nilgiris and even the distant Coimbatore plains and mysore plateau. I found the winding and steep drive (from Ooty town) through natural forests to Dodabetta very picturesque and thrilling. As a matter of fact, most of the time I find the journey (by road) to a tourist 'spot' more fascinating than the destination itself which is usually teeming with tourists and vendors. Ooty Lake : Very close to the railway station / bus depot. A nice lake with beautiful surroundings and facilities for boating, etc. 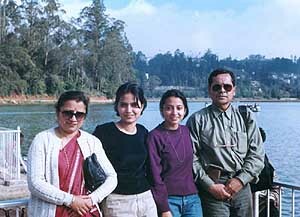 But not as good as my favourite Indian lake -- Nainital. The maintenance of Ooty Lake also leaves much to be desired as I observed that a huge stretch is overgrown with water hyacinth (in this particular respect, it reminded me of the Dal Lake at Srinagar which I last saw almost two decades ago). Of course, the hyacinth, etc., did not prevent us from doing the normal tourist things like posing for photographs as, having spent the money, we had to enjoy whatever our holiday destination presented us with! Now, don't get me wrong! All said and done, the family had a very nice and relaxing holiday. But our best moments were on the lawns of the Dunmore House -- sunlazing! !